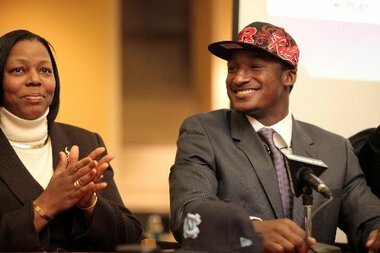 Today is National Signing Day which is the first day that High School Football players are allowed to accept a College Scholarship offer by signing a binding letter of intent. National Signing Day has become something of a Holiday for College Football fans, much like the NFL Draft is to the NFL. What makes it so interesting are the quirks of the individual players, who in this case are 17 year old local celebrities. Players have gotten into all kinds of shenanigans over the years. There have been fake outs by kids picking one school only to turn around and instantly go with their real choice. Some have even had the unwitting coach of the team he is faking out attend their live announcement. Ouch. There have even been kids who made up the whole thing and held live TV announcements only to be discovered later to be completely making it up. But hey, getting on TV is getting on TV. Today comes with lots of excitement for many fans who want to see all of their schools "verbal" commitments become real and see where those remaining "undecided" players will decide to play. In particular the top ranked player overall is still undecided and is thought to be choosing between South Carolina, Clemson, LSU, and Alabama. But I think just about ever College Football fan is hoping that he surprises everyone and chooses their favorite school. Mostly because it looks like this when Jadaveon Clowney plays football. You can track your favorite school's scholarship offers and subsequent commits here at 247sports by just swapping your school's name in for Rutgers in the URL. ESPN also has a good auto updating page here. Rivals and Scout both specialize in this kind of stuff but all of the relevant info is stuck behind a paywall, so I won't promote it here. Andy Staples had a great write up last week about where college recruiters have to go to secure the hardest position to find, Defensive Tackle. He analyzed current NFL players hometowns and US State obesity charts to determine the where the best states are and it looks like it correlates pretty well with where those NFL Defensive Tackles are from. It's a great article and well worth a read if you are interested in the depth that these colleges go to recruit the top talent in the country's High Schools. Let me know in the comments your school's wins, losses, and of course any surprise commits today. wow!this has been so good to have free gems and coins for steam wallet games.click to visit and grab them online.